A state-of-the-art computer laboratory with internet facilities was donated to Srimath John Kotalawela Maha Vidyalaya, Piliyandala recently under the innovative ‘E-Thilina’ initiative, a corporate social responsibility (CSR) collaboration between ESOFT and Sirasa Television. Under this project, schools are invited to submit a request through Sirasa TV where they are first evaluated to ensure access to an IT teacher, strong student interest in IT and the availability of space to house a computer laboratory. Once a school is selected, all equipment and infrastructure are transported, setup and configured on the school premises by ESOFT, resulting in a fully equipped lab which students and teachers can start using and benefiting from immediately. The core purpose of this ongoing community service endeavor is to ensure that every child gets the opportunity to achieve basic IT literacy and therefore, a chance at a brighter future. 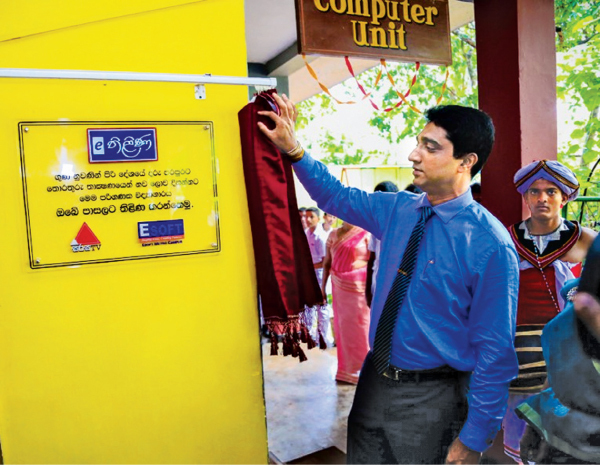 The ceremonial opening of the 25th such E-Thilina computer laboratory was held on June 14, 2017. It was attended by Dr. Dayan Rajapakse, Group Managing Director – ESOFT Group of Companies, Nishan Sembacuttiaratchy, CEO - ESOFT Metro Campus, Upul Dassanayake, General Manager - ESOFT Metro Campus, Harsha Ravindra, Assistant Manager – Branch Operations – ESOFT Metro Campus, Kosala Ovitagala, Branch Director – ESOFT Kiribathgoda, Lasanthi Ovitagala, Branch Manager – ESOFT Kiribathgoda, Daminda Nissanka, Sales Manager – MTV/MBC, Sanath Nandana, Executive Programme – Sirasa TV and Ramyalatha Weerakkodi, Principal - Srimath John Kotalawela Maha Vidyalaya, Piliyandala. Expressing his views on the initiative, ESOFT Group Managing Director Dr. Dayan Rajapakse said that ESOFT is committed to boosting the uptake of IT across the country as it is fast becoming an essential skill in any industry. He further noted that encouraging children to increase their IT literacy could bring great dividends for Sri Lanka and stressed the importance of preparing the next generation of young people to meet the challenges of a global economy. The very first E-Thilina recipient school was Kumbukwewa Maha Vidyalaya (Kurunegala) in October 2014 followed by Sevamuktha Kandoru Navodya Maha Vidyalaya (Polonnaruwa), Dombagoda Maha Vidyalaya, (Matara), Kottukachchiya Maha Vidyalaya (Puttalam), Uduhawara Vidyalaya (Welimada), Ranasinhe Maha Vidyalaya (Minuwangoda), Rikillagaskada Vidyakara Maha Vidyalaya (Rikillagaskada), Hadigalla Janapada Maha Vidyalaya (Baduraliya), Dharmapala Maha Vidyalaya (Rathnapura), Dutugemunu Primary School (Buththala), Sreepali College (Horana), M.D. Yapa Maha Vidyalaya (Waralla), UB/Wanninayake National School (Galgamuwa) Mayurapada Central College (Narammala), Mahanama Navodya College (Panadura), Jinaraja Balika Maha Vidyalaya (Gampola), Ku/Athugalpura Princess College (Kurunegala), Galagama Maha Vidyalaya (Nakulugamuwa), Embilipitiya Maha Vidyalaya (Embilipitiya), Kegalu Vidyalaya, (Kegalle), St. Gabriel’s Girls College (Hatton), School for the Deaf (Ratmalana), Vivekananda Ladies College (Batticaloa), Pilana Vidyarthodaya Vidyalaya (Galle) and most recently, Srimath John Kotalawela Maha Vidyalaya (Piliyandala). Established in 2000, ESOFT is the largest private sector education network in Sri Lanka with an island-wide branch network of 40 centres and a strong commitment to both corporate and national sustainability.